Our martial arts classes in Burnaby differ in the sense that adult students can take advantage of an mixed martial arts training class once a week where we focus primarily on boxing, kickboxing and grappling. Like any martial art properly taught and properly practiced, Taekwondo is a non-aggressive and ethical system of self-defense. Taekwondo developed from humble beginnings over 2,000 years ago and has since spread internationally to become one of the world's most successful and popular martial arts. Its practitioners enjoy physical and mental discipline, as well as excellent fitness and the ability to defend themselves if necessary. Taekwondo is not only a combat sport, but is also a way of life for enthusiasts around the globe. 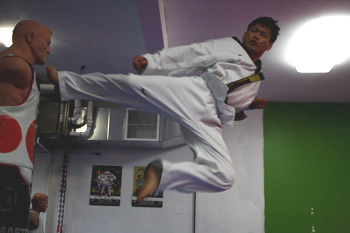 The word Taekwondo itself is made up of three Korean words: Tae, meaning to kick or jump; Kwon, meaning fist or hand; and Do, which means "the way." Loosely (if not literally), it can be thought of as "The Way of the Hand and Foot."